We change by choice…..it’s not just my brand and my business, but it’s really the root of how I live my life. When you want to change – it’s just a series of choices. When you don’t want to change – you don’t make those choices. One choice at a time. Break it down and simplify things. It’s about one choice at a time. Whether you want change in your relationships, health, career, self-love, finances, freedom….these simple steps apply. So let’s start to dig into this…because I’m sure that not a day goes by where you don’t want some kind of change to happen. It’s part of our evolution and growth as humans; we are constantly changing as we learn and as we age and as the world around us changes. This may not be what you want to hear…but the only way, truly, to achieve lasting change in your life is by taking small steps. It seems counter-intuitive; when the change you want already seems so far away that taking these baby steps to get there just seems pointless and as if you’ll never get there. It feels impossible. Break it down into a series of small steps and small changes. It’s all about the compound effect; when you implement small steps, consistently over the long term, it eventually leads to a point where things start to tip. 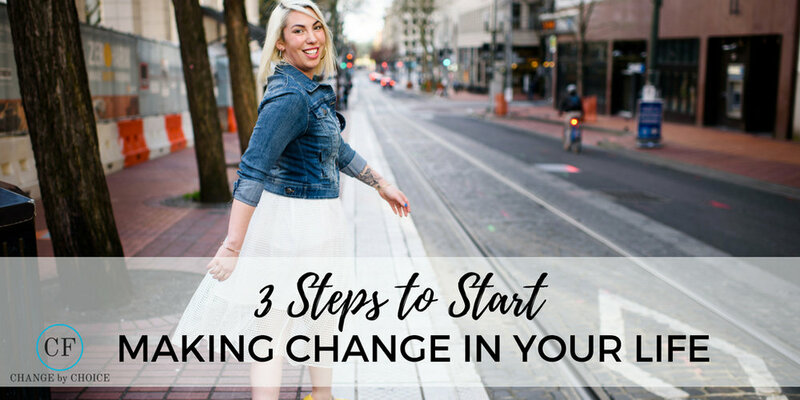 You can make huge, drastic changes overnight…but they’re not going to be lasting changes. They aren’t going to be changes you can keep up with in your life because you haven’t trained your behaviours and your mindset to be on board with those changes yet. Easy example: you want to start waking up earlier so that you have some time for yourself and some self-care in the mornings. You decide that tomorrow you’re starting; so instead of setting your alarm for 7am, you set it for 5. What happens in the morning? You’re excited about these new changes, so you’re up at 5 and you do your thing. Tomorrow? You snooze the alarm until 7:15. You start making excuses as to why you can’t get up at 5am that day and why you deserve the extra sleep. Nothing changes. We can have huge goals and dreams and these big changes that we want in our lives; I’m not at all saying you should play small here. What I am saying is to dream big but also be realistic when it comes to your life, your time and your individual circumstances. Set yourself up to succeed by working towards changes that are within the realm of your possibility. With my example of the mom with a baby, it’s not to say that you’ll NEVER be the person who wakes up at 5am daily; it’s just not in your current realm of possibility with babies who don’t sleep through the night.